Published in Hydrologic Process is a paper from our 28 years of research on Mount Baker. 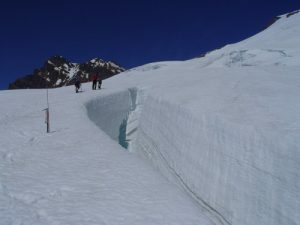 Crevasse stratigraphy of accumulation on Easton Glacier on Mount Baker, note the annual layer. Mount Baker,North Cascades, WA has a current glacierized area of 38.6km2. 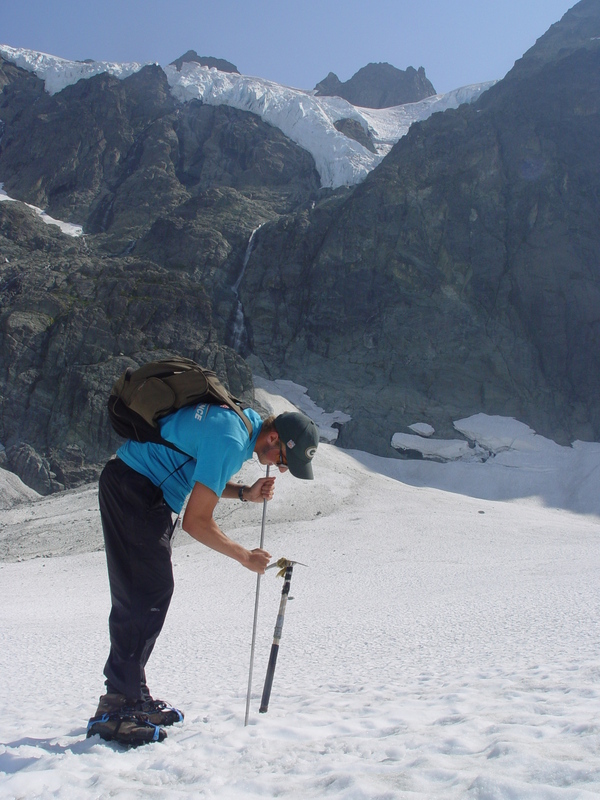 From1984 to 2010, the North Cascade Glacier Climate Project has monitored the annual mass balance (Ba), accumulation area ratio (AAR), terminus behavior and longitudinal profiles of Mount Baker glaciers. The Ba on Rainbow, Easton and Sholes Glaciers from 1990 to 2010 averaged 0.52 m water equivalent per year (m/year). 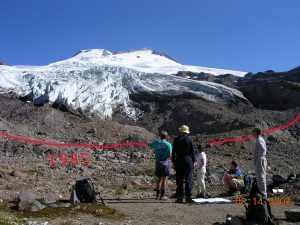 Terminus observations on nine principal Mount Baker glaciers, 1984–2009, indicate retreat ranging from 240 to 520 m,with amean of 370m or 14ma1. AAR observations on Rainbow, Sholes and Easton Glaciers for 1990–2010 indicate a mean AAR of 0.55 and a steady state AAR of 0.65. A comparison of Ba and AAR on these three glaciers yields a relationship that is used in combination with AAR observations made on all Mount Baker glaciers during 7 years to assess Mount Baker glacier mass balance. Utilizing the AAR–Ba relationship for the three glaciers yields a mean Ba of 0.55 m/year for the 1990–2010 period, 0.03ma1 higher than the measured mean Ba. The mean Ba based on the AAR–Ba relationship for the entire mountain from 1990 to 2010 is 0.57 m/year. 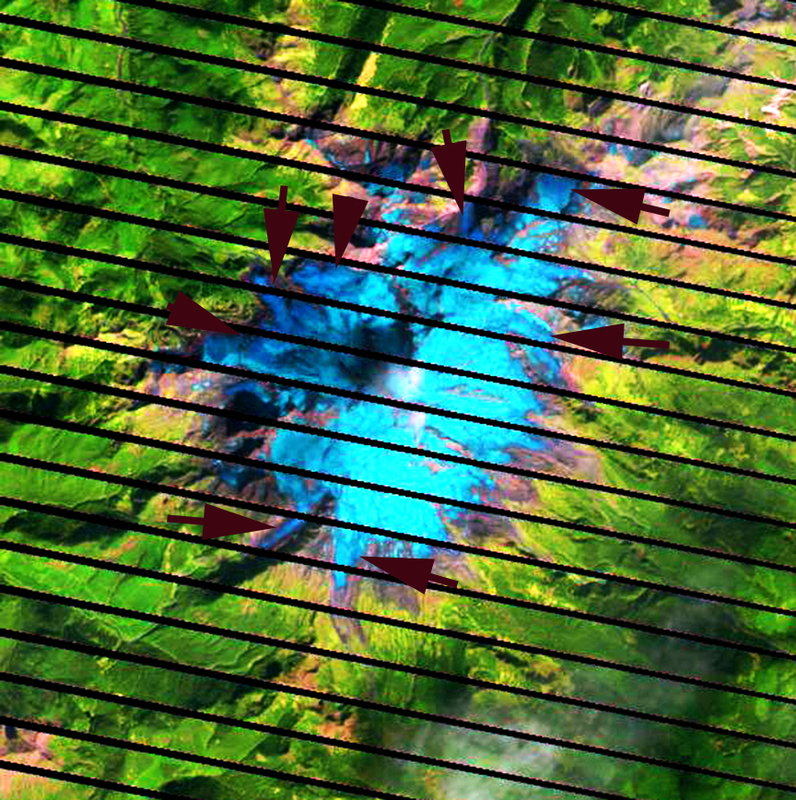 The product of the mean observed mass balance gradient determined from 11 000 surface mass balance measurements and glacier area in each 100-m elevation band on Mount Baker yields a Ba of 0.50 m/year from 1990–2010 for the entire mountain. The median altitude of the three index glaciers is lower than that of all Mount Baker glaciers. Adjusting the balance gradient for this difference yields a mean Ba of 0.77 m/year from 1990 to 2010. All but one estimate converge on a loss of 0.5 m/year for Mount Baker from 1990 to 2010. This equates to an 11-m loss in glacier thickness, 12–20% of the entire 1990 volume of glaciers on Mount Baker. 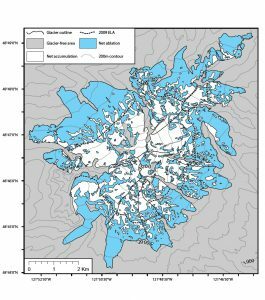 Easton Glacier terminus retreat from 1985 to 2003 driven by mass balance loss. Mount Baker bare ice and retained snowpack map for 2009.